Beverage (or bar) carts are often associated with the holiday season. But in my mind, a beverage cart is essential to home entertaining all year round. 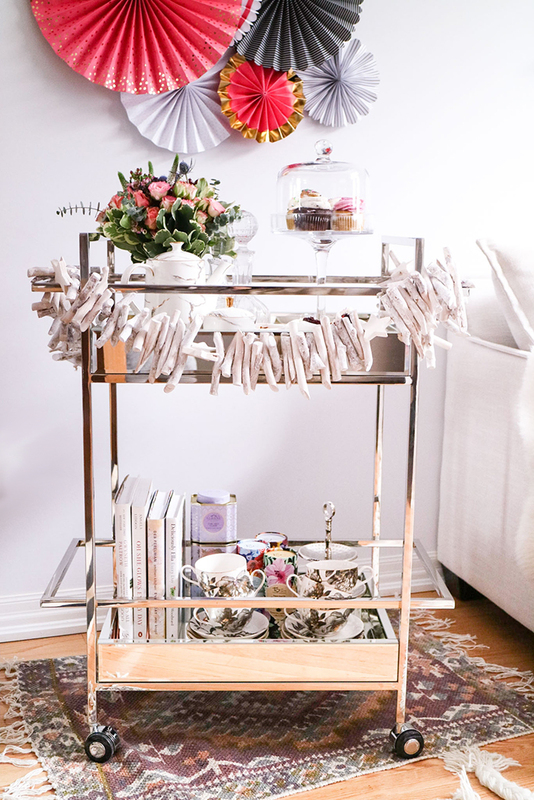 Whether you’re in the mood for a cocktail or a cup of afternoon tea, there are so many ways to integrate a bar cart into your living space that’s suitable for anyone! 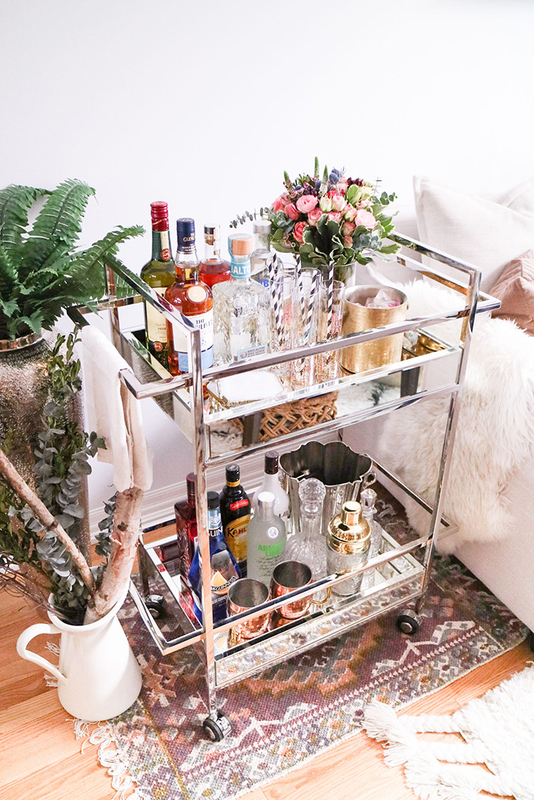 I struggled for quite some time in finding the perfect bar cart. I was never quite happy with the options because they were either too wide, too glitzy, didn’t have enough storage or just way too expensive. That led me to hack my own version a few years ago. Though my DIY version held its own after countless house parties, it was finally due for an upgrade. 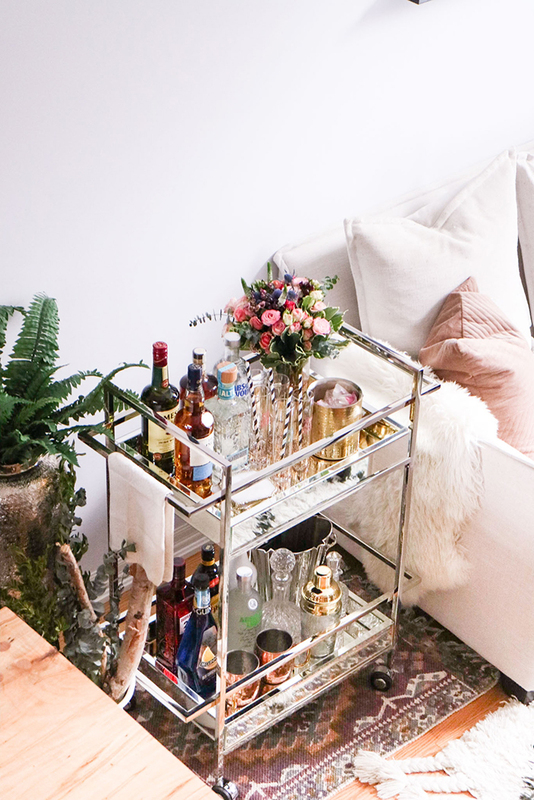 I was so pleased (and impressed) by this bar cart from HomeSense. Not only was it affordable (selections range from $200-$300) but it checked all the boxes from my list of requirements. It’s sleek, compact yet enough depth and width for storage, a perfect compromise of feminine vs. masculine style, and come on, it’s a beauty! 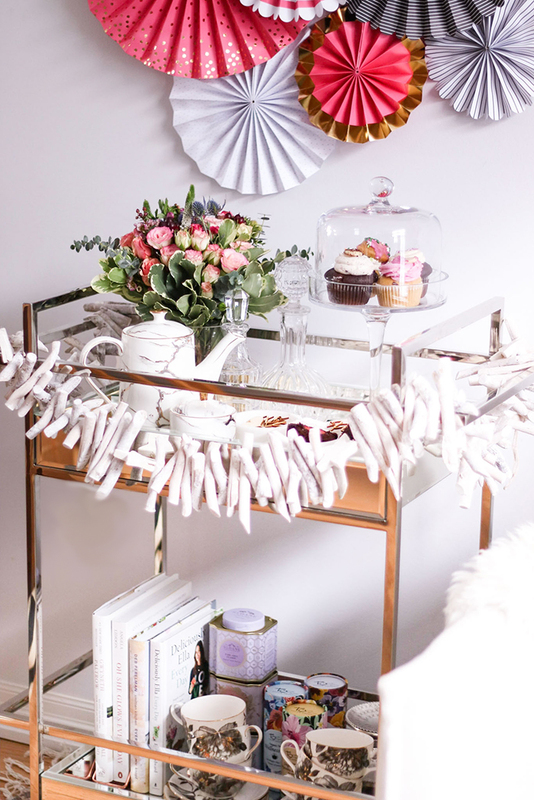 To show you just how versatile a bar cart is, I styled it two ways just in time for your Valentine’s Day celebrations. 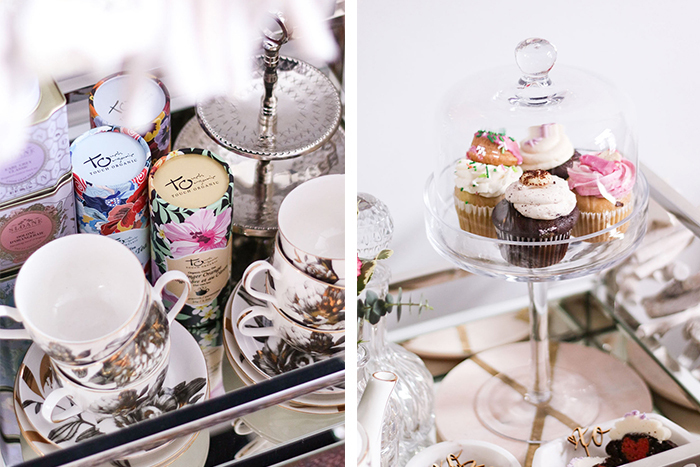 The first is my rendition of an afternoon tea-party station, perfect for Galentine’s Day with the favourite ladies in your life. Essential to styling any beverage cart is a living plant. 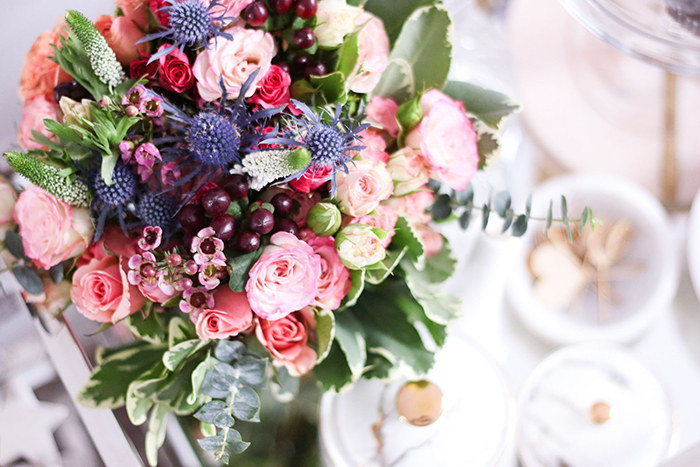 In this case, I brought in a beautiful farmboy bouquet from Tonic Blooms. It adds an instant uplift and a feminine touch. 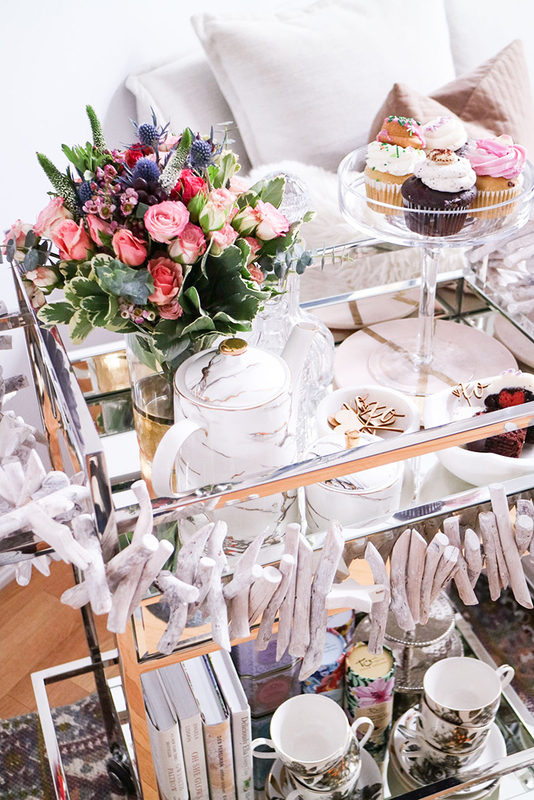 The perfect pairing for a cup of cozy tea are of course treats! I stopped by Tori’s Bakeshop for a few special cupcakes. Trust me, if you haven’t stopped into this place, I highly recommend it. They have so many delicious cupcakes that even come in gluten-free and vegan options too. You no longer have to break an arm and a leg for a tea set. 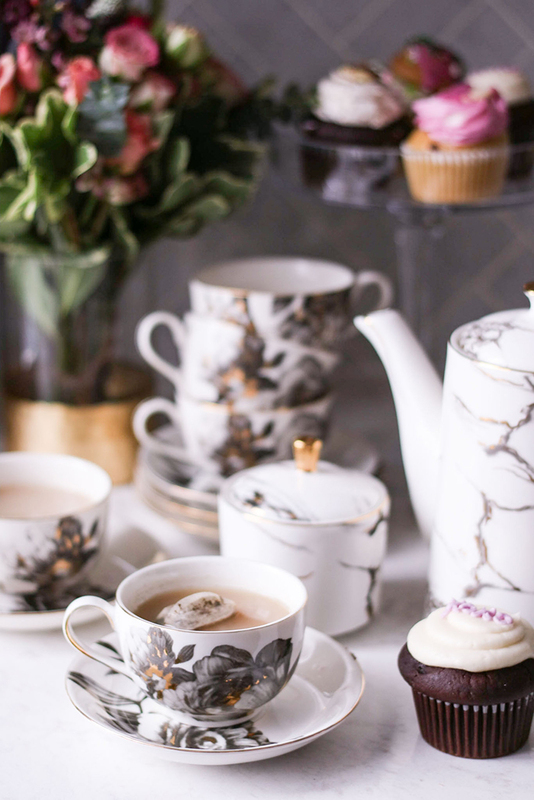 This floral gilded tea cup set, marble print tea pot and matching accessories were all found at HomeSense. They are so incredibly beautiful, super affordable and there are many options in-stores. 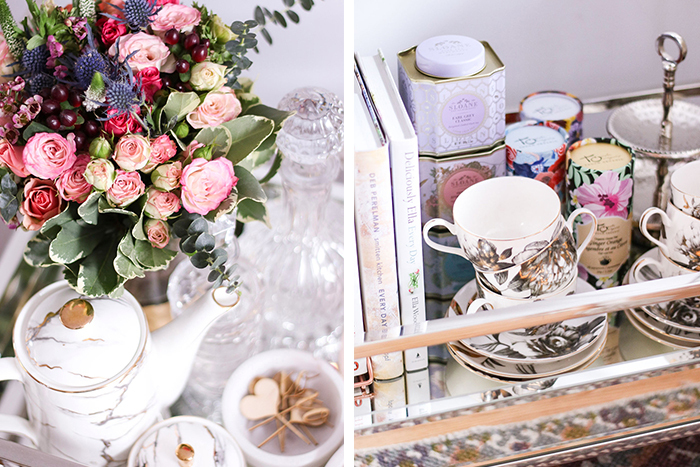 Last but not least, be adventurous when it comes to serving up a cup of delicious tea. Try swapping out traditional Earl Grey or English Breakfast with a flower-infused or spiced version. Many teas are also available at HomeSense. 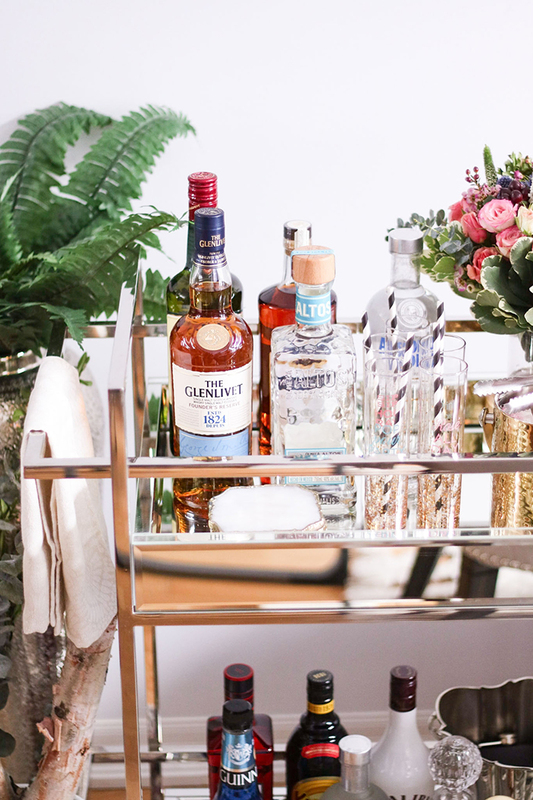 My second take is a more traditional approach to bar cart styling. 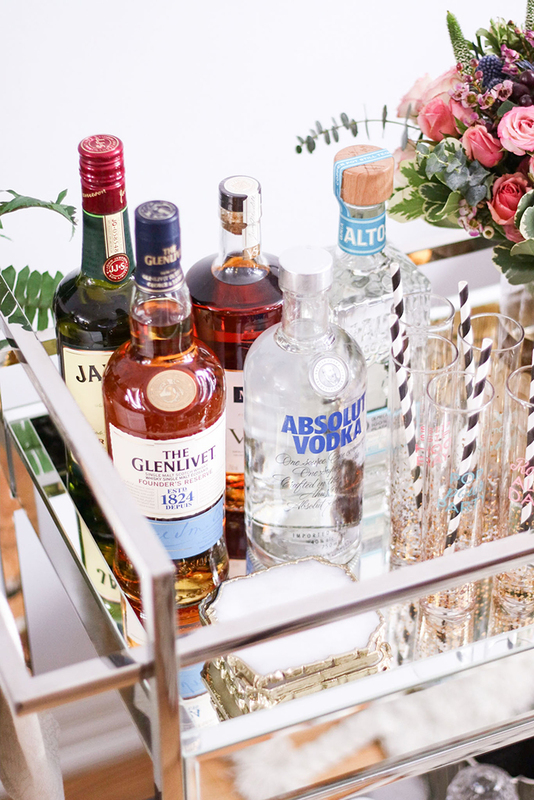 If it is your first time stocking up a bar cart, sticking to the essential is key. That goes for both the must-have accessories and a collection of spirits and liquor that will allow you to concoct up just about any classic cocktail. 1x bottle of Scotch Whiskey: The Glenlivet Founders Reserve. This brand offers custom labels and they are free and easy to create! It’s a great idea to make for Valentine’s Day as well as birthdays and anniversaries! 1x bottle of Cognac: Martell VS Single Distillery. This is the oldest cognac house in world and makes a classic Sidecar cocktail. 1x bottle Gin: Beefeater. Gin is by far one of my favourites. You can never go wrong with a sophisticated Gin & Tonic. 1x bottle of Rum: Malibu. This is great for the summer when paired with pineapple juice or blended into a Pina colada. 1x bottle Coffee Liqueur: Kahlua. This is fantastic to add to a piping cup of coffee or hot chocolate during the colder season and it is also a great addition to desserts. 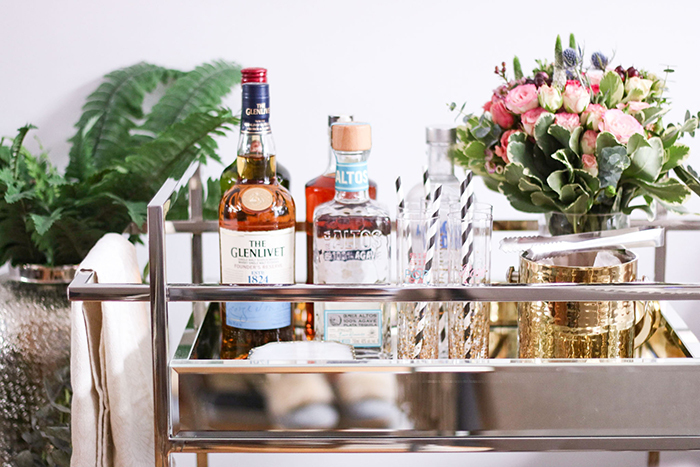 Just because you’re stocking up for a few classic cocktails, it doesn’t mean you can’t have fun with the bar accessories! 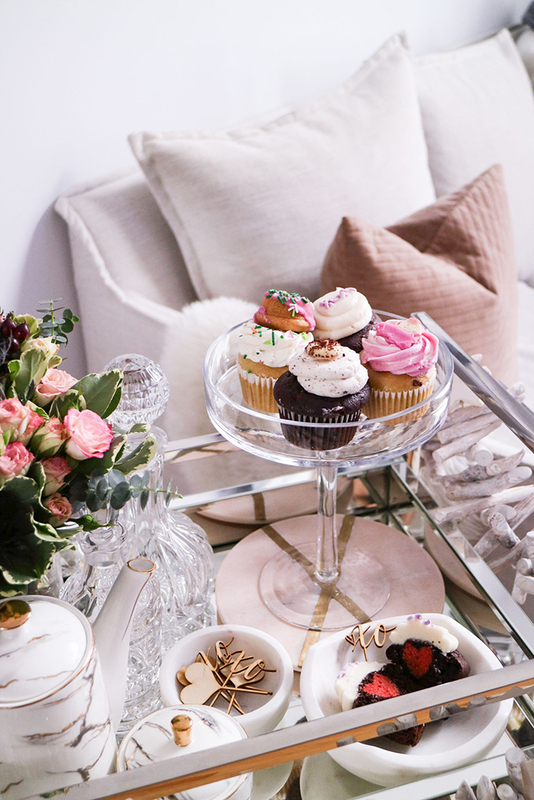 HomeSense carries an array of unique barware such as fancy champagne glasses, agate style coasters, and shiny ice buckets for a fraction of the price! A bonus tip to add major points to your entertaining game is freezing your ice cubes with fresh flowers petals. It’s super simple and oh so fun! 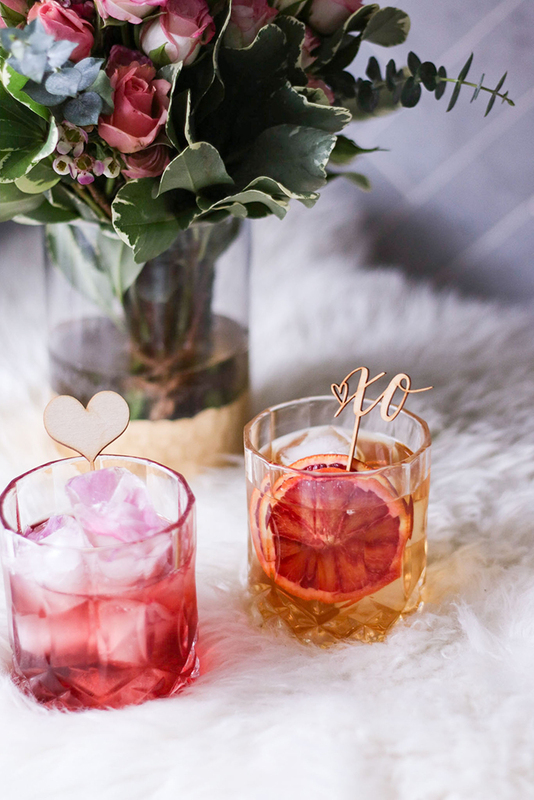 To celebrate Valentine’s Day, why not try your hand at a his and her cocktail? 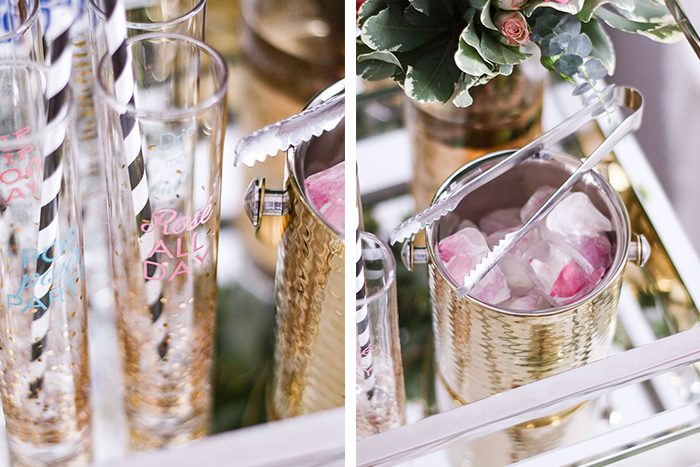 Whether you’re a cocktail lover or a tea drinker, I hope you enjoyed these styling tips! And remember to please enjoy responsibly!